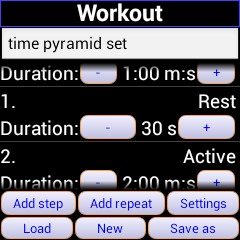 I have been doing some tweaking to get IpBike running better on true Android SmartWatches. I have an Omate TrueSmart as my first test watch. 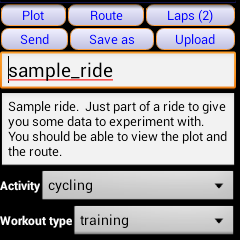 Version 1.5.6 of IpBike is availible for download for anyone wanting to test the tweaks. Future google Play releases will have the support build in as standard. I have added some new default screens and added a feature to enable the screen to be locked from a menu option. Unlocking can not use any of the curent key over-ride methods as there are no suitable keys. You unlock by pressing the power button twice to switch the screen off and on again and then having to physicaly tap the device within 5 seconds to unlock the screen. This will be needed if your going to be out in the rain as the very sensitive touchscreen on the TrueSmart is not very happy in the rain. Main display before starting. Just press Start GPS then Start Trip once the gps has a good fix. The buttons at the bottom allow quick access to the other main screens when not active and are hidden when you start. Distance and 30 second average speed are next you can change the units and have pace instead of speed if you want. Active time and active average speed follow. Pauses are automatically removed. You have the option of having the real versions of these without the pauses removed if you want. Gps accuracy (I am indoors for the screenshot) battery % and time. Map screen. There is a choice of map sources and also options that work with no data conection. This is one of these options in this case I have the MapsForge style map of all of the UK downloaded to the device. The Map will auto center and auto rotate for easy navigation and you can upload a route to follow if you want. An alternate acreen with just speed distance and time setup nice and big along with the main control buttons. The display is fully customisable with as many seperate screens as you want that you can swipe left and right between. The items on each screen can be chosen and configured as you want and you can even have a totaly different colour scheme. Main display when active with speed overlaid on the main control buttons which are still usable. Distance and 30 second average speed. Active time and active average speed, pauses are automatically removed. IpBike supports multiple bikes and as you can see form this screen shot this is the way I have things setup with running and walking as seperate bikes. For each bike you can set various options like the default for displaying Pace or speed or the level of Gps filtering to apply. 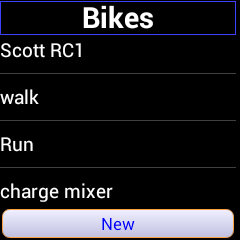 You also configure the bike toy get the right sort of callories calculation. 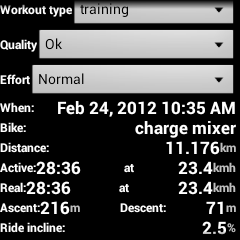 Post ride stats are availible in a scrollable screen. The description will be uploaded to most of the upload targets although filling too much in on a watch is of course challenging. Default activity and workout are configurable per bike. Heart rate data for the current Android 4.2 based Trusmart can only come from old style BlueTooth sensors. If an Android 4.3 update comes along then IpBike has support for Bluetooth Low energy sensors with support for the Heart rate, Bike Speed and Cadence, running Speed and cadence and bike Power profiles. There are SmartWatches in the pipeline with ANT support build in for which IpBike has extensive support. 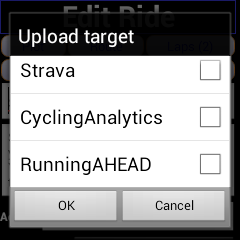 Post activity data can be uploaded to a number of popular sites including Attackpoint, RunKeeper, TrainingPeaks, SportTracks.mobi, Strava, CyclingAnalytics, RunningAHEAD and TrainingTageBuch. 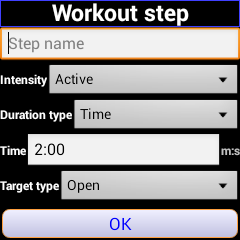 Ipbike includes a sophisticated workout timer that lets you define all sorts of styles of interval traing sessions. You can get feedback via text to speech or the vibration feature of your TrueSmart. Workouts contain a number of steps that can be repeated, you can even do repeats of repeats to say 3 sets of 5 times 2 minutes on one minute off. Steps can be active or rest. The duratiuon can be based off distance or time. You can set a target level for the step.